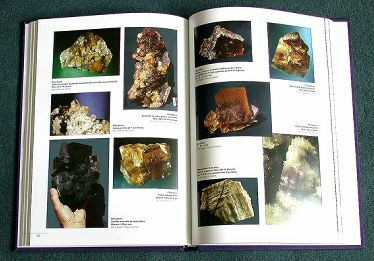 This book is a monograph of a mine of fluorite. However, it contains many informations which are common to Valzergues and other hydrothermal ore deposits in the world. This book is divided into four parts. Some chapters describe topics which are common to other fluorite mines. 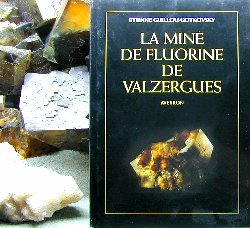 The book entitled La Mine de fluorite de Valzergues was rewarded in 2000 by the price Paul GRENIER . In this first part, the geological history of this mine located 12 km the south of Decazeville (Aveyron) is described. The development of hydrothermal veins in Valzergues (and in other mines having the same morphology) is explained there. Finally, the mine of Valzergues is located in its context: the "Massif Central". - Mines of fluorite in "Massif Central"
This second part is an approach of all the mining works done in Valzergues fluorite mine. This part is also devoted to crystal locations. If Valzergues site is well-known over the world, it's because numerous top-class cristals have been extracted from this vein. Blue fluorite from the mine. 1.Prospection by Victor Lassalle and works followed by the instatement of the S.M.V. Workers and production of the Valzergues fluorite mine. The Valzergues fluorspar and its use. In this chapter, you will discover the greatest industrial uses of fluorspar through the previous century. This last part is interesting for everyone: collectors of fluorite and people discovering crystals for the first time. A large panorama of some crystals which are extracted from this mine and contributed to the world fame of this mine, is drawn up. Conclusions, Annexas and Glossary complete this book. They bring a little more light on the works done in the various fluorite mines and the industrial uses. Unfortunately, these data are not always well-known. Finally, an important bibliography will bring many references to you, on the local as well as on the general point of view. colf fabric and gilding with mark page.